Insulin-like growth factors 1 and 2 (IGF-1, IGF-2) are peptides that are similar in amino acid sequence and structure to insulin and can bind to the insulin receptor having the same glucose lowering effect1. IGF-1 and 2 also binds to the type 1 IGF receptor and are largely responsible for the growth promoting effects of growth hormone. The Type 1 IGF receptor also binds insulin but with lower affinity and is likely responsible for the anabolic effects of insulin beyond those of glucose uptake. There is a type 2 receptor but it only binds IGF-2 and does not appear to be involved with the anabolic effects of IGF-2. IGF-2 has largely been ignored as a promoter of skeletal muscle anabolism but since it signals through the same receptor as IGF-1, it will produce similar anabolic responses. IGF-1 binds to the type-1 receptor which acts through a cascade of transcription and differentiation factors such as AKT, glycogen synthase kinase 3-beta (GSK-3b), mammalian target of rapamycin (mTOR), myoD and others to increases amino acid uptake and protein synthesis and decreases nitrogen excretion while stimulating the differentiation of satellite cells which can result in growth not only of skeletal muscle but also of internal organs such as the spleen, liver and heart. Circulating IGF-1 is produced by the liver in response to stimulation by growth hormone. IGF-1 in skeletal muscle is produced locally and stimulates hypertrophy and hyperplasia locally in what is referred to as a paracrine action. When produced locally, IGF-1 is often modified to form a slightly different protein called mechano-growth factor or MGF. Testosterone stimulation of the androgen receptor has been shown to result in local production of IGF-1 in skeletal muscle. IGF-1 circulates in the plasma bound to a family of binding proteins. These binding proteins extend the half-life of IGF-1, which is usually very short. They also transport IGF-1 to target cells and modulate the action of IGF-1. There are six known IGF binding proteins. Under most conditions, IGF binding proteins seem to inhibit IGF-1 activity, probably by reducing the free concentrations available for binding. IGFBPs also inhibit IGF-1 activity by competing with IGF-1 receptors for IGF-1 binding. IGFBP3 can interact directly with cell membranes (possibly through a receptor of its own) to inhibit the action of IGF-1 and to exert effects of its own. IGFBP5 is widely considered to be a potentiator of IGF-1 action, probably by delivering IGF-1 to its receptor. Androgens increase IGFBP5 levels while reducing IGFBP3 levels which further suggests that IGFBP3 is a negative regulator if IGF-1 activity while IGFBP5 is a positive regulator. IGFBP4 has been shown to be an inhibitor of IGF-1 anabolic action in skeletal muscle. It is no wonder that such a potent anabolic is being used illicitly to try to enhance muscle strength and size. Recombinant IGF-1 in various forms is available for research purposes and though it is not intended for human consumption, users have been experimenting with it for quite some time. Some have attempted to inject recombinant IGF-1 subcutaneously but the quantities needed and the short half-life result in minimal efficacy. Local intramuscular injections seem to produce some local anabolic effect but again, the short half-life limits its utility. A variant form of IGF-1 called Long R3 IGF-1 that has minimal binding to IGF binding proteins and a longer half-life has been used to promote anabolism. The down side to this particular form of IGF-1 is that it circulates at high levels in an unbound form. Circulating IGF-1 has been shown to be associated with tumor progression while IGF binding proteins (particularly binding protein 3) have been shown to protect against tumor progression, likely through restricting the actions of IGF-1. Another form of IGF-1 that has been proposed as an anabolic agent is des(1-3)IGF-1. 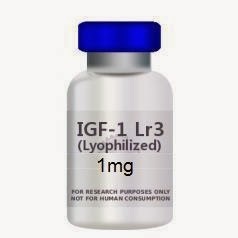 This shortened form of IGF-1 is incapable of being bound by IGF-1 binding proteins and is much more potent in stimulating hyperplasia in skeletal muscle. Injected locally, this peptide may have better growth promoting properties than native IGF-1. The use of IGF-1, especially in a systemic fashion, will result in decreased natural production of GH. The IGF system is complex with multiple ligands and binding proteins whose roles are not fully understood. The IGF-1/AKT pathway has been demonstrated not just to promote growth in skeletal muscle but also in internal organs and to play a role in the progression of cancer suggesting that this pathway must be carefully regulated to prevent serious side effects. The fact that these peptides are not scheduled and are available in a pseudo-legal fashion makes them much more available than AAS but with a potentially much higher liability profile. This is one of the unfortunate unintended consequences of the criminalization of AAS.